RUSH: Ladies and gentlemen, there’s a new book coming out very, very soon. 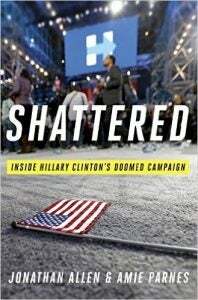 It’s by Jonathan Allen and Amie Parnes, and it’s a book on Hillary Clinton’s failed campaign and what went on. And it focuses and highlights all of the infighting, the very low morale, the lack of trust between Hillary and many of her staffers, the intervention of Bill Clinton trying to save the day and failing, all of the heated exchanges. And the book doesn’t say one thing about the Russians being responsible for any of it. It’s a devastating look at the Clinton campaign. And it confirms what many people have speculated, that it was a bunch of people thinking they were guaranteed to win, nobody working really hard, nobody thinking very straight about it. It’s a fascinating read. RUSH: This book on the Hillary Clinton campaign. It’s just… It’s great. It just makes mincemeat. It explains why they lost, and it doesn’t mention Russia once. It’s by Jonathan Allen and Amie Parnes. So we’ll get into that tomorrow. But the dysfunction and the arguing and the bickering and the arrogance? It makes perfect sense that they lost, when you read it — and these are the kinds of things they knew during the campaign. They just kept it for the book.